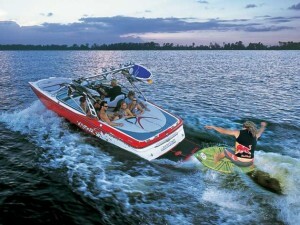 Lake Arrowhead boat rentals and watercraft services. Arrowhead is mostly used by tourist and the communities of Los Angeles. Lake Arrowhead is popular for business and corporate boat activities including wakeboard boat rentals, jet ski tours, sea doo rentals, PWC watercraft rentals, and water sport lessons. As a scenic mountain resort in the San Bernadino Mountains, Lake Arrowhead’s economy is almost completely supported by tourism, both by casual vacationers and part-time residents. Try out Arizona Boat Rentals water sport lessons which include wakeboarding lessons, wake surf lessons, water ski lessons, and air chair instruction. The primary tourism industries include real estate, lodging, dining, water recreation, boating tours and guided charters, and retail sales. While Lake Arrowhead has no official town center, the Lake Arrowhead Village serves as the main commercial area for both locals and tourists and includes a number of factory outlets, boutiques, restaurants, and a supermarket.